Petmozx & Mrs. Marple currently features 5 videos and 622 photos. This is Petmozx & Mrs. Marple's Amateur Wife Photo Blog. Free VCitizens can simply follow Petmozx & Mrs. Marple and every post will be transferred to their private VCity wall. Petmozx & Mrs. Marple's Amateur Wife Photo Blog has 464 more pics and videos posted for freely registered VCitizens only, because Petmozx & Mrs. Marple wants the postings to be licked, followed and commented - all of that requires you to have a registered VCity nickname. 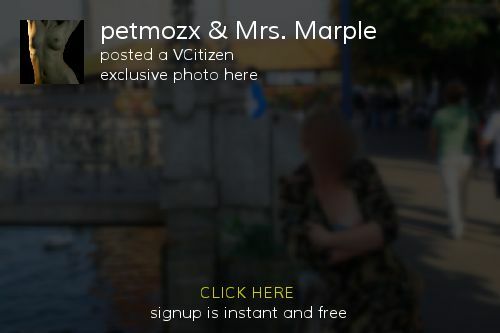 Register your free VCitizen Nickname now for instant access to gazillions of more postings on Petmozx & Mrs. Marple's Amateur Wife Photo Blog and entire VCity. This amateur wife photo blog is a free service of VCity. It features 5 videos and 622 photos uploaded by the owner of the blog.